Although i said that i've decied to back it anyway as i would like it on BD, i love Emma (made me cry) and reminds me that i need to finish getting the manga. sorry never gonna happen, as i've got the lovely sets in the chipboard boxes with booklets. Wayne Grayson (Joey Wheeler, Michaelangelo) will be playing Richard Jones in the Emma dub. They added some previews from his audition. And a preview for Eleanor. Many have commented that she sounds too old, but this is just from her audition so the end result might sound lighter. ^Still no word on whether or not they will be True HD though. They are apparently 4 discs a season which should rule out SD-BD. So then it's just question if they are Upscales or New Scans. I'm praying to god that these are true HD. If these are upscales my world is over. 7 episodes per 50GB disc is like 6.4GBs per episode (if only using 45GBs of the disc since closer to 50 the more failures you get in reproduction) gives me some good hope. Selecta Vision (Spain) released upscales on Blu-ray with 3 discs per season. Yes, and they are terrible. S1 for example is exactly the same as a korean fan's release. What we need is actual true HD rescans. Discotek Day hasn't officially happened but the whole slate has likely leaked on Amazon.com. A solid month, less of the stuff that I personally want from Discotek but all of God Mars for such a cheap price is pretty exciting. I really wonder if next year SD-BD will take off with Funimation, Sentai and Viz jumping on board, I hope so. Sentai already is due to fully phasing out DVDs. In less exciting news apparently the Slayers BDs coming out in Japan are going to be sodding upscales *sigh*. Not only that but the company doing them is King Records who have an appalling record handling upscales i.e Blue Seed and 3x3 Eyes which were both upscaled from composite masters (basically Laserdisc quality). This is really sad news, I was honestly pretty hopeful about getting a proper HD release after the Movie and OVAs got such wonderful releases. I really hope there is a solid reason as to why they can't do a proper release i.e the film elements just simply don't exist or are heavily damaged, because if not then it's another angry face I'm making at a Japanese company. Honestly they make the western companies look like gods in comparison at times. For the money they charge I cannot even fathom why they don't put in more effort with classic shows. Pretty much every studio and company over there have a handful of upscales of Cel shows on their track record, it's really sad. Well it might still be better than the current DVD releases, and the Spain upscale is just DVD release with a colour fix. And that's why Discoteks Blue Seed SD-BD is using the old masters that ADV made for their dvd release. Justin Sevakis said the materials sent from the licensor were in a right state. 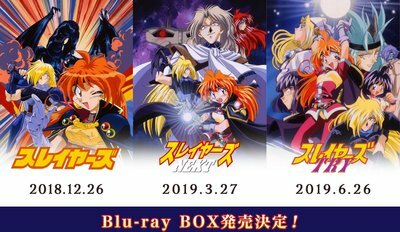 I think the issue with Slayers is none of its DVD masters are particularlly that good so unless there is a master just sitting around in JP that is decent we're in trouble. I'm maintaining my pre-order for now, but I'm hoping we get some footage, or something before it releases.